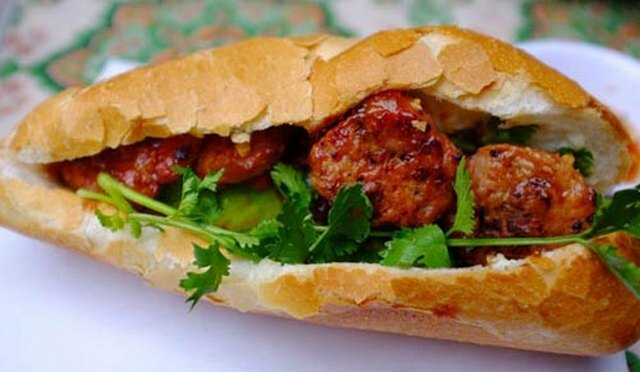 Vietnamese banh mi sandwiches are regarded as one of the “super food” by foreign diners. 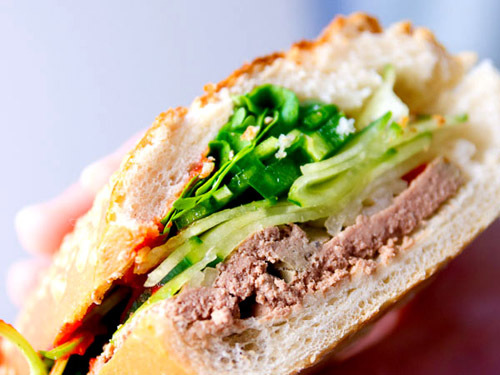 The banh mi is a delicious and ever-varying combination of deli-style pork, pate and veggies (carrots, cilantro, cucumber, etc), stuffed into a soft and crunchy French baguette. This is a family run shop run since 1974. It has a reputation for closing whenever the cooks run out of ingredients. The ingredients are pork deli meat, fatty char siu pork, pork floss, creamy pate, Chinese 5 spice and, curiously, butter. The sandwich maker finishes it off by pouring pork-chili gravy inside. Banh mi of the shop at 118A Hue Street was praised by BBC correspondent David Farley as “the best sandwich in the world”. “They don’t really like overly complex food in Hanoi, but so many things in here have a function: the pork floss soaks up the sauce, the pate adds moisture and the fact that the baguette is lightly toasted keeps it from getting soggy in this immense humidity,” he commented. “Banh mi Phuong in Hoi An” is the first result when you type the words “The best banh mi in Vietnam” on Google. This dish captivated the two celebrity chefs Anthony Bourdain (the US) and Cameron Stach (Canada). After enjoying, Anthony Bourdain said “That’s a symphony in a sandwich” while Cameron Stauch tried to learn to share all the secrets to make such delicious banh mi. The menu board says “bread, pork, ham, pate but there is so much more: long slices of cucumber, fresh cilantro, pickled carrot and even juicy tomato slices. Phuong finishes it off with a flurry of sauces: a squirt of chili sauce and two different pork sauces, one from boiled pork and one from smoked pork. The key to a good banh mi is, in fact, the bread. A bad baguette – a hard, crumbly log – will ruin an otherwise fine sandwich. Phuong’s bread, baked right next door, is ultra-soft, almost deflating when taking a bite, while also maintaining a crispy exterior. In 2013, Nha Trang sidewalk banh mi was selected by National Geographic magazine as one of the 11 best street foods in the world. In the article, it did not specify the address of the banh mi shop but includes only a photo of a typical banh mi shop in the city. “Serving with a smile, a Vietnamese vendor taps a colonial legacy to create an irresistible street cuisine. 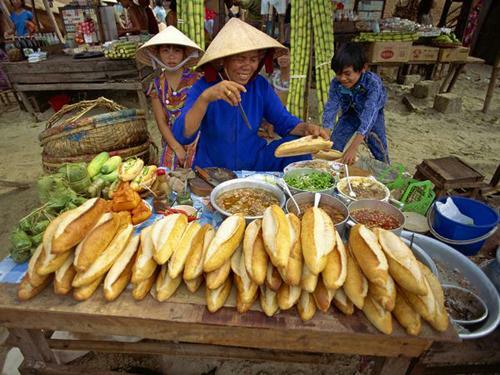 Banh mi sandwiches, like these in Nha Trang, feature French baguettes filled with a tasty variety of meats and vegetables. They are eagerly consumed across Vietnam, especially for breakfast or lunch,” National Geographic wrote. Condé Nast Traveler, an American travel magazine, chose grilled bread and meat on the sidewalk of Nguyen Trai Street (District 1, Ho Chi Minh city) as one of the 12 most attractive street foods in the world.